For me, one of the hardest things about cooking is multitasking. Keeping an eye on several things at once; making sure the bread doesn't burn while constantly stirring the sauce; running between salad-making and meat slicing. Not to mention trying to time everything correctly so that each piece of the meal is ready at once: the beef has rested for an appropriate 10 minutes, the vegetables are perfectly hot and the pasta is just al dente. This can be further complicated if you're running between the grill outside and the oven or stove inside. Impossible! Now, all is fine when my fiancé is doing the grilling outside and I'm doing the sides inside... but sometimes I like to get my grill on as well! 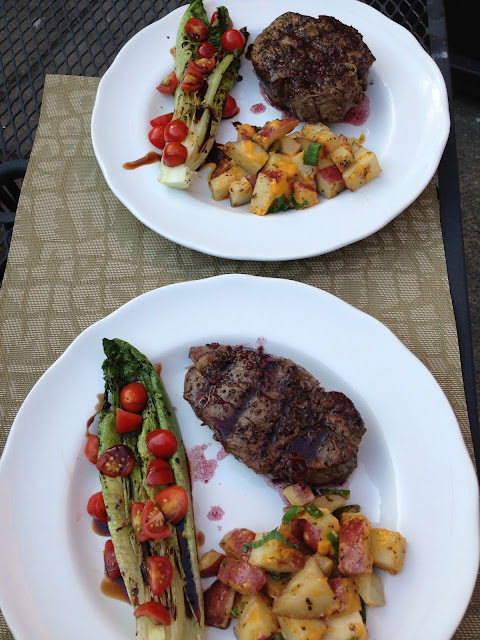 This past weekend, I wanted to cook up a *perfect* Friday dinner: juicy steaks on the grill with delectable side dishes. How would I watch the steaks grill to a perfect medium rare outside while also cooking my sides, though?! Lightbulb! I'll grill all of my sides as well! An entire dinner made on the grill: filet mignon with a browned butter red wine sauce, foil packet cheesy red potatoes, and grilled romaine with tomatoes and balsamic reduction. Y'all. I am STILL thinking about this meal. It was honestly one of the best dinners I've cooked EVER! Don't believe me? 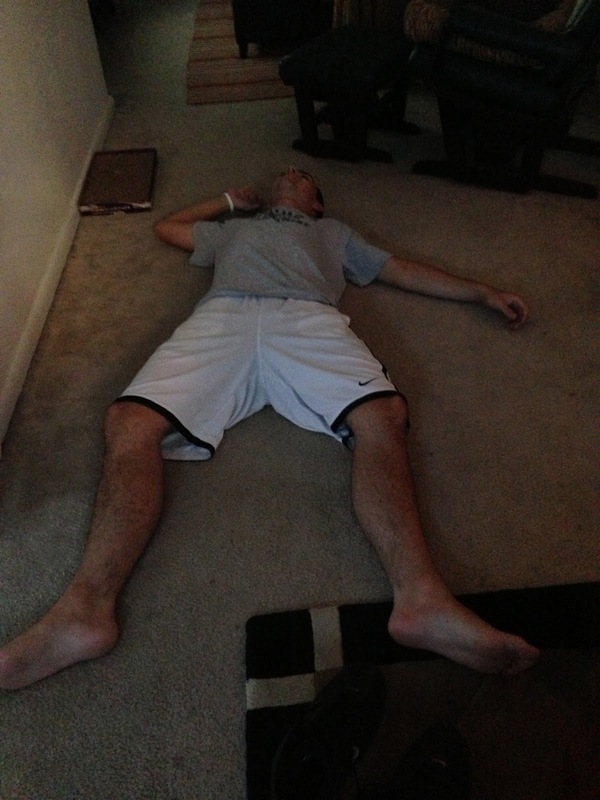 I literally floored Ryan. Yep, he was on the ground, paralyzed in pure ecstasy after we ate. I'm going to tell you exactly how to make a delicious steak dinner with grilled sides -- and make it look EASY. Because it is! The trick is preparing everything that needs to be done inside first. That way, there's no running between the stove and the grill. You can just hang outside, watch the steaks, and enjoy an ice cold beer. Wait 'til you try these sides. Foil packet red potatoes couldn't be simpler. 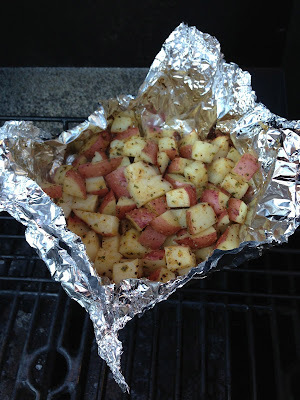 Chop up some potatoes, toss them in olive oil and spices, throw them in some foil, close it up, and put 'em on the grill. A few minutes before they're done, top with hand-grated cheddar cheese and sliced green onions. It will melt into a packet of delicious, cheesy goodness. Also delicious? Grilled romaine! Who knew?! This was my first time grilling lettuce.... which, I know, sounds a little weird. Ryan was a bit skeptical. But seriously... it's amazing! 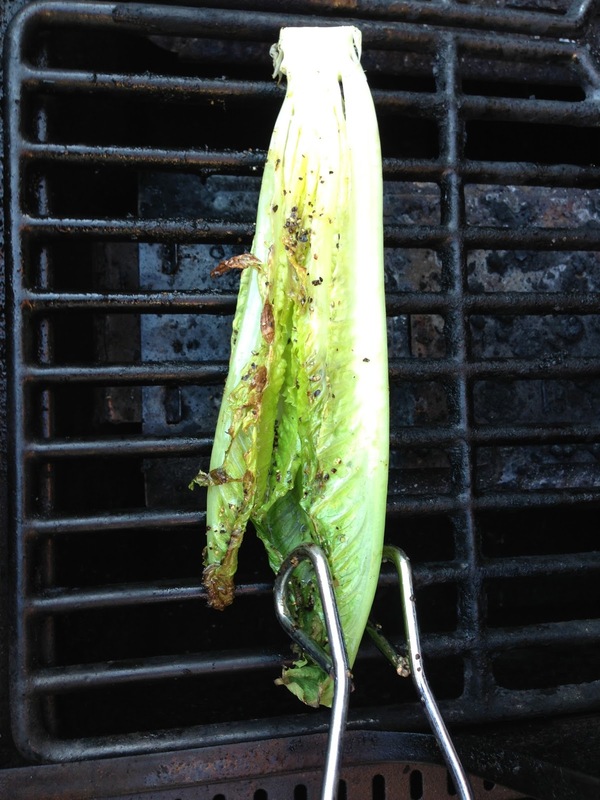 The romaine gets a bit charred and there's this awesome, unique grilled flavor to your salad. Top it with diced summer tomatoes and balsamic reduction and you've got the perfect salad. Side note: have you made your own balsamic reduction yet? Don't tell me you've bought it pre-made at the store. It's as easy as pouring some balsamic vinegar into a pot and turning on the heat. That's. It. Perfectly thick, sweet, amazing balsamic reduction in just a few minutes. Do it. This is the meal dreams are made of. Okay, before we go outside, let's get everything prepared. First, prepare your balsamic reduction. Heat about a cup of balsamic vinegar in a saucepan over high heat until it begins to boil. Reduce heat to medium and continue to cook until it reduces to about 1/3 - 1/2 cup. While that's happening, chop your red potatoes into small pieces. Toss them in a bowl with olive oil, garlic powder, dried (or fresh) parsley, sea salt, and black pepper. Pour the mixture onto a large sheet of heavy duty aluminum foil. Okay, potatoes are ready. If the balsamic has reduced, pour it into a bowl. While you cook everything else, it will cool and transform into a wonderful, syrupy substance. Amazing. Now, begin to prepare your browned butter red wine sauce for the steak. Then, once it's done, just let it cook over low heat while you do everything else. Also prepare your romaine: Wash and dry well. Chop off the very end. Remove the loose, dark, thin pieces from the outside (they'll burn too quickly). Drizzle with olive oil, sea salt, and black pepper. Also, dice your tomatoes so they're ready to go. Hand-grate a couple ounces of cheddar cheese and dice your green onions. Okay.... the stage is set. Everything is ready. Go light the grill to medium/high. Place the packet of red potatoes on the grill away from direct heat. They take about 25-30 minutes total. The steak will take about 10-14 minutes to grill plus 10 minutes to rest. 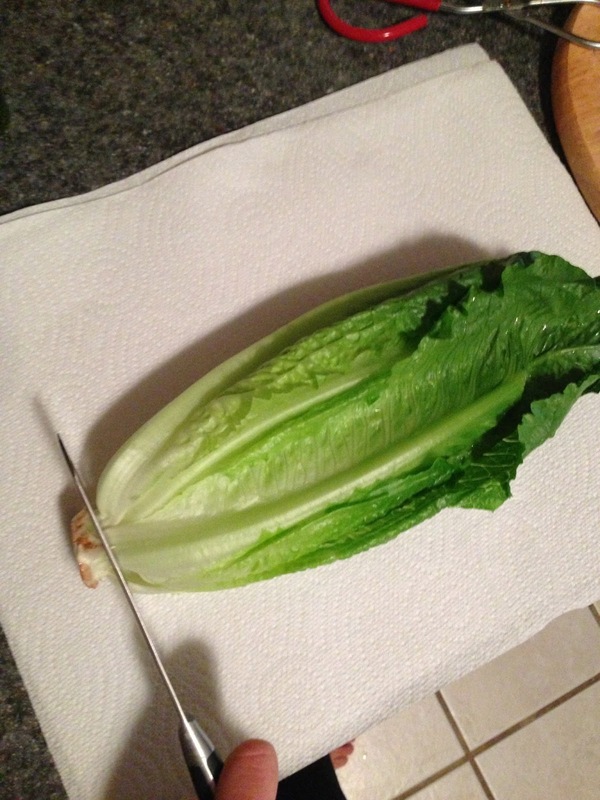 The romaine takes about 5-7 minutes to cook. Do the math, and plan accordingly. After about 20 minutes, your steaks should be done and ready to rest for 10 minutes. Your potatoes are ready to get the cheese and onion treatment. Open 'em up. Sprinkle with the cheese and green onions. Close the packet slightly and allow the cheese to melt. 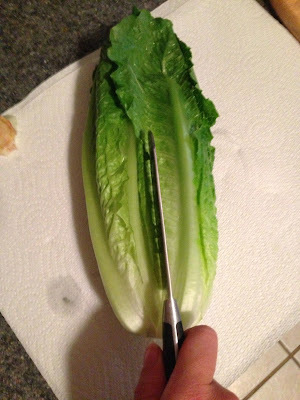 This is a good time to start your romaine. 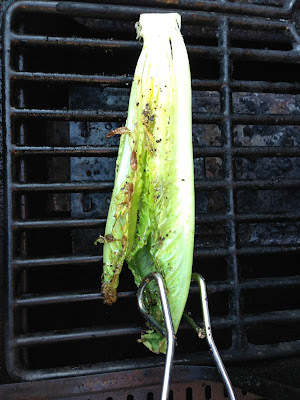 Place the romaine on the grill, flat side down first. Let them grill for a couple of minutes, then do a quarter turn. You want it to get slightly browned/charred on all sides. It should take about 5-7 minutes total. Around this time, your potatoes should also be ready. Plate your steaks. Top with your browned butter red wine sauce. Plate your grilled romaine. Top with chopped tomatoes, then spoon your now-cooled balsamic reduction overtop. Scoop a nice helping of cheesy red potatoes onto the plate as well. -Chop your potatoes into small, approximately 1-inch pieces. Put in a medium sized bowl and mix well with olive oil and spices. 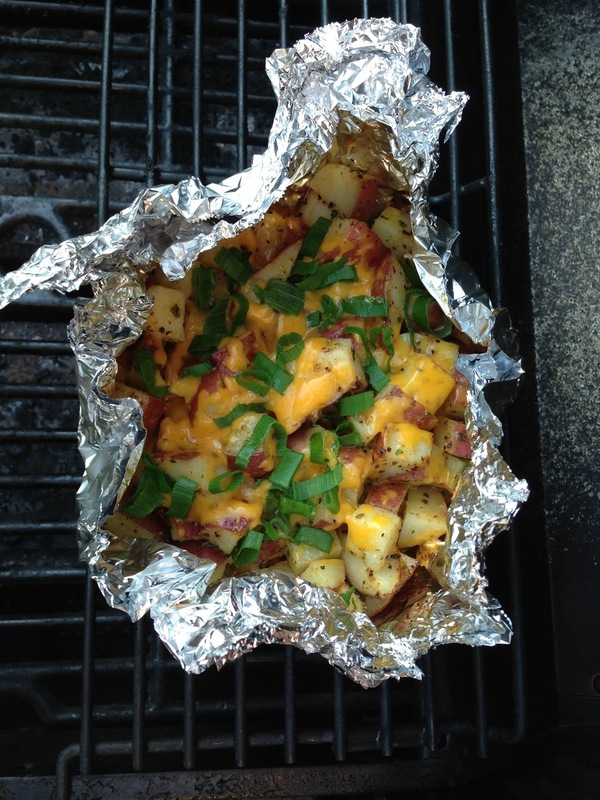 -Lay out 1 large sheet of heavy duty aluminum foil (or double-up regular foil). Pour the potatoes onto the middle. Close the foil up tightly. 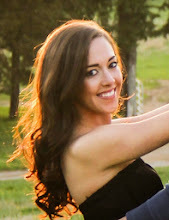 -Light grill to medium/medium-high. 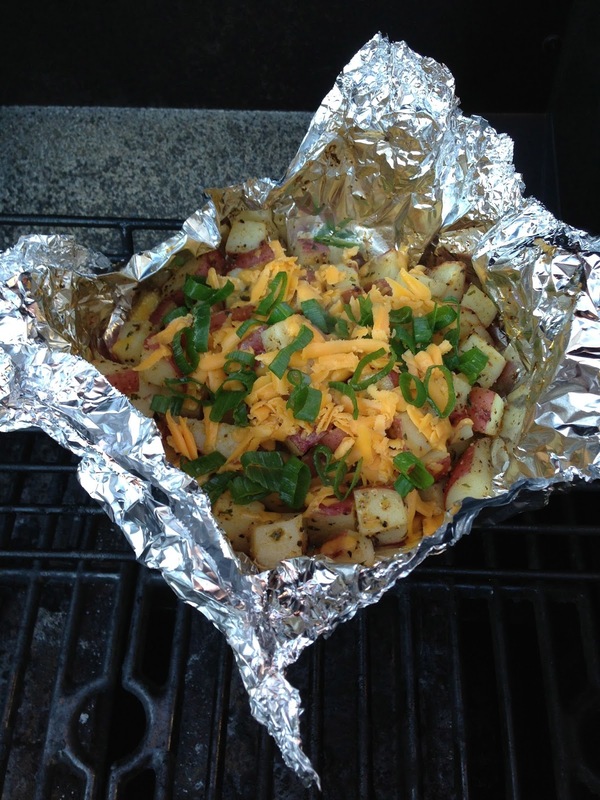 Place potatoes on the grill away from direct heat. Close. Cook for about 20 minutes. 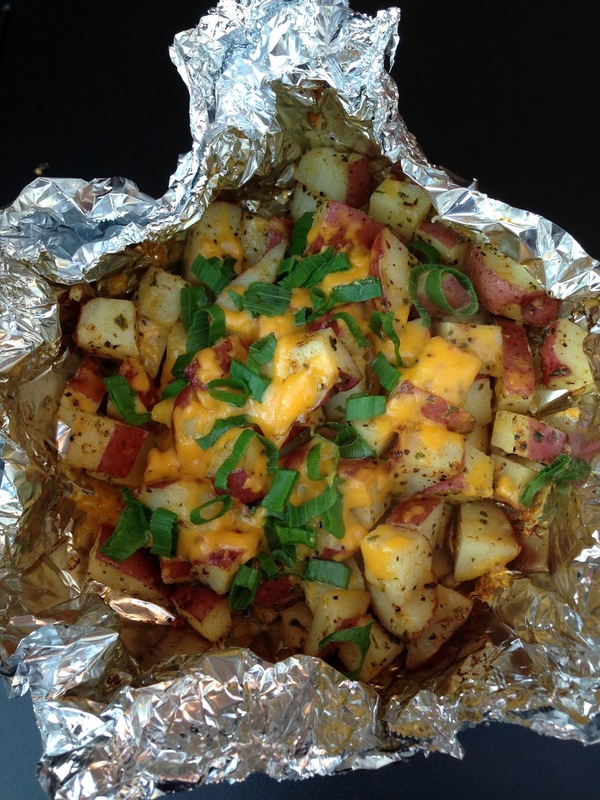 Open foil, sprinkle with the cheese and green onions. Close foil slightly (don't need to close tightly again) and let cheese melt and potatoes finish cooking, another 5-10 minutes. -Cut the hard end off of the romaine (but leave enough for the lettuce to stay intact). -Slice the heart of romaine in half length-wise, leaving 2 separate pieces. 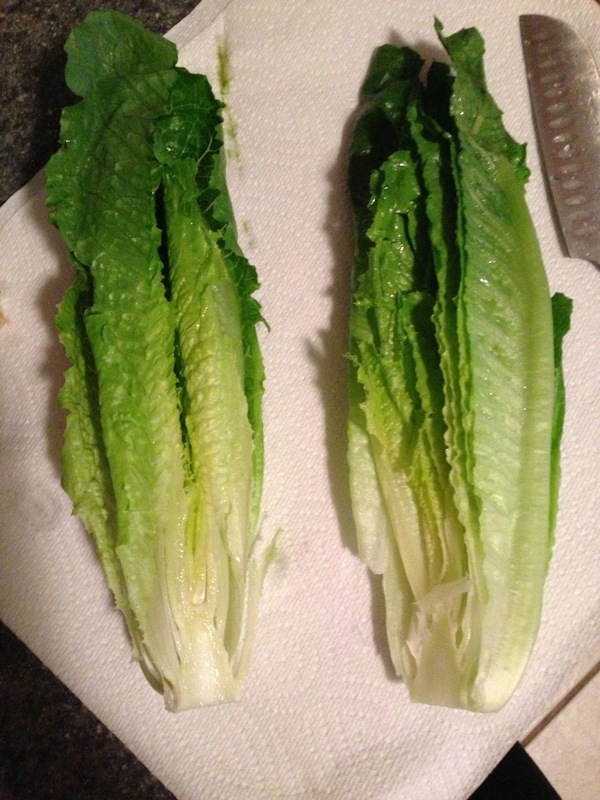 Remove the thin, dark, outer pieces of lettuce (they will burn too quickly). -Drizzle the flat side with olive oil. Season with salt and pepper. -For balsamic reduction: Pour vinegar into a small saucepan and turn heat to high. Bring to a boil. Reduce heat to medium and cook until it has reduced to about 1/3 - 1/2 cup. Pour into a bowl and let cook/thicken for 15-30 minutes. -Heat grill to medium/medium-high. 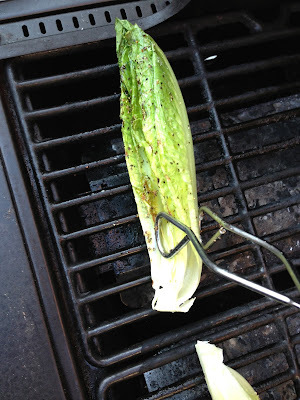 Place romaine on the grill, flat side down first. 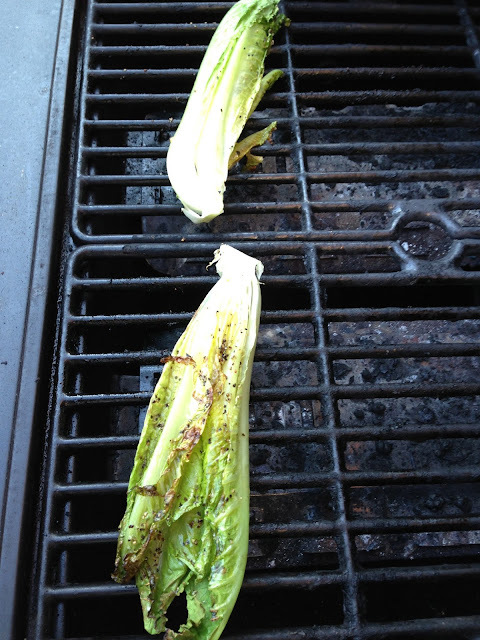 Let get slightly browned/charred, then turn 1/4 turns until all sides of the lettuce have been grilled. -When done, top with chopped tomatoes and drizzle with balsamic vinegar. I'm on the floor just reading this post!!! I know you're stretched for time and all but if you ever feel like coming up to Toronto to recreate this meal for me it would be much appreciated!